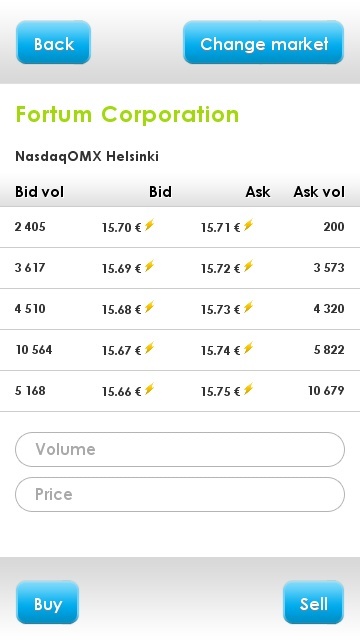 Nordnet Mobile Trader is polished and good looking financial mobile application that will offer market information, stock trading, financial news and view to users portfolio. All of this in real time. Application rating for Symbian was between 3-3.5 and for Meego 4-4.5. Update: Nordnet has cancelled the maintenance agreement due to Nokia’s decision to abandon Symbian & Meego platforms so that Nordet can focus on those platforms that the users will be using in future. This app has been withdrawn from the app store. When application was withdrawn from OviStore it had been downloaded by five figure count of users. On top that there is also screen that is inviting users to come customers of Nordnet. 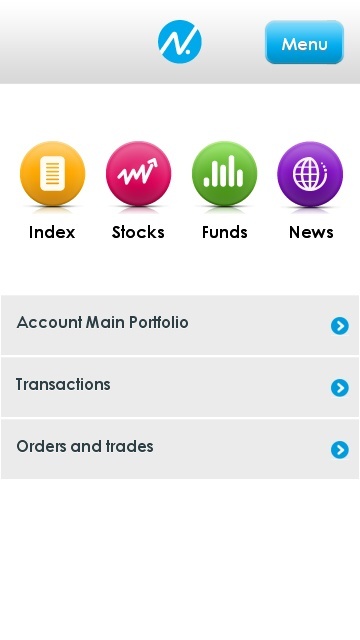 Application is providing for all users for free live updating market information for selected amount of indecies, currencies, commodities and interest rates in this section. 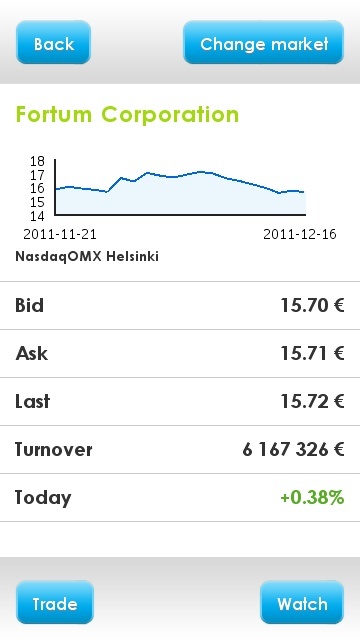 If user is also customer of Nordnet he could purchase access to some additional realtime market information feeds. 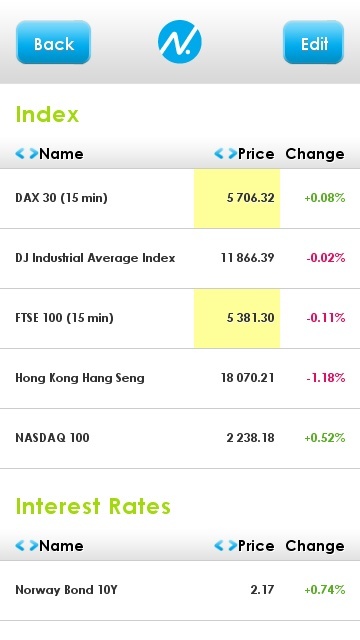 Application is providing same way as for indecies live updating feed for stocks. Market information is delayed for the users that are not logged in, and realtime for logged in users that have proper rights in place. Funds section in application allows user to search funds from the big amount of funds that Nordnet is offering for it’s customers. It is also providing links to the fund prospectus pdf files so that users can learn more about any fund. On the last fund section screen it was possible to send subscription or redemption orders for any of the offered funds. News section is having live updating news title screen. Each news title works as a link to actual news. On top of the news screen there is news source settings that allowed user to customize news subscriptions. Selected soureces were provided for free and some other were possible to purchase through Nordnet’s web pages. Portfolio was showing content of the users portfolio(s) at Nordent. Stocks, Funds and Money. If user had several portfolios then each of them was listed here separately. 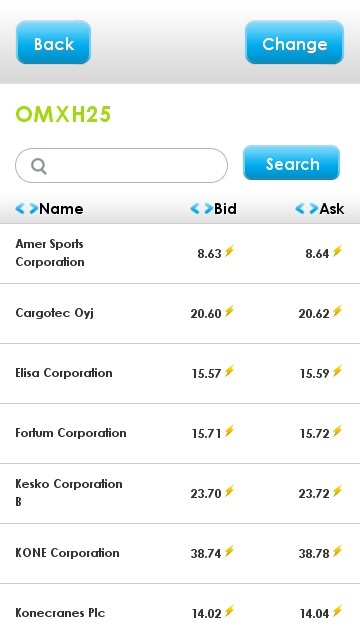 Ready made Stock lists and users own stock lists offered easy access to see details of any stock and trading. On trading screen there was realtime updating L2 marketinfo available to allow fast trading. After order was inserted there was confirmation screen that user could still verify his order. After order was confirmed application redirected user to order status screen, which was showing orders status in realtime. Order execution was fast and in normal case the order was already executed and visible as a filled in the order status screen when user managed to see it. Transactions screen was showing each transaction separately so that user could easily follow up that what is happening in his account at Nordnet.